Using a hammer, the culprit struck the teenage victim up to 15 times, crushing her skull and brutalizing her face. The author outlines an intriguing story of police who were overly sure of the man they arrested for the murder. After the girl, two months’ pregnant, was identified by her family, the investigation led to the home of Ebenezer Pook, where she had been employed as a maid. Satisfied that Pook’s son, Edmund, was the guilty party, despite his uncanny calmness and denial, the police arrested him. However, they made a number of mistakes, jumping the gun and neglecting to give the customary caution against self-incrimination. Edmund consistently denied anything to do with that “dirty girl,” and his imperturbability continued through hearings in front of the magistrate at Greenwich, the inquest, and his trial. At the trial, Judge William Bovill, who seemed to be clearly in favor of the defendant, refused the admission of what was termed “hearsay.” That evidence—plus Jane’s statements to two people naming the baby’s father and claiming she was planning to go away with him on the day of the murder—could have completed the case. The defendant’s clothing was spotted with blood, though it could only be identified as mammalian. 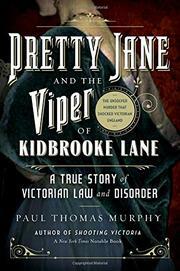 The author’s strong knowledge of Victorian culture helps him clearly describe the class conflict this case aroused. The trial and its aftermath demonstrate how class differences doomed those at the lower end. Victorian murder mysteries are usually entertaining. Even without a Sherlock, this highly readable story still shows the cleverness of the police and the frustrations of prosecutors.